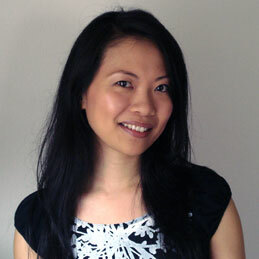 Hi, my name is Jannie Ho (pronounced Jane-nee) and I’m an illustrator specializing in children’s books and products. I’m also known as Chicken Girl. I went to Parsons School of Design with a BFA in illustration. After graduating, I worked as a graphic designer and an art director at many fun places such as Nickelodeon, Scholastic, and TIME Magazine for Kids before going full time as a freelance illustrator. I've illustrated more than 2 dozen books and my work has appeared in magazines, toys, crafts and digital media. I'm currently based out of Boston, MA. Q: Hi Jannie! 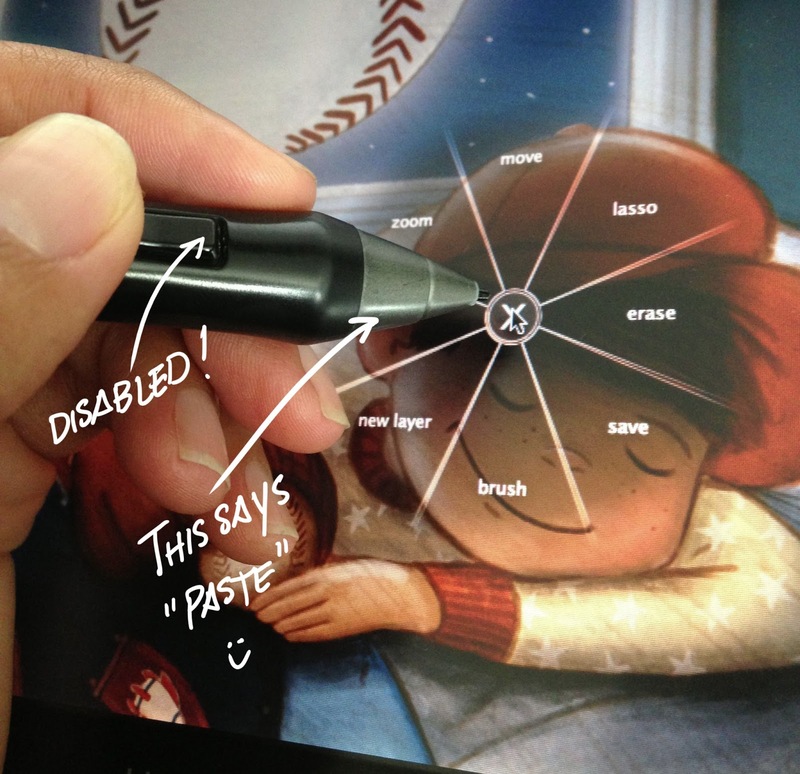 Does your past as a graphic designer and art director influence the decisions you make in your illustrations? I think so, in many different ways. Illustrations can be part of an overall layout and I'm always thinking about that as I create. 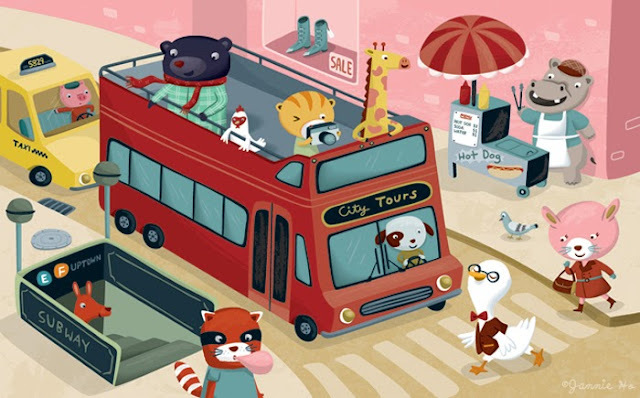 What can I do in my illustrations that would ultimately offer more for the art director to design around? Lately I've been thinking about how working at Scholastic book clubs had influenced my style and color decisions for quite a long time in my illustrations. I use to design the book club flyers and there was constant talk about making the book covers pop. Yellow as a background color was a very popular way to make things stand out, and for a long time, I had a hard time using other colors for a background. Also I was designing for a younger age group and the colors I ended up using all the time for my design ended up in my illustrations. And ultimately my illustrations geared more towards a younger age group too. Q: Your characters are absolutely adorable. Where do you get inspiration for their clothes and colors? Thank you! I use to often get feedback that the clothing style in my characters tend to be a little old fashion. But now that I have a child, I'm more aware as to how real kids dress, and what all the cute kids clothing stores are. Lately I've been into looking at Mini Boden (http://www.bodenusa.com/en-US/Mini-Boden-Clothing.html) for inspiration. Their color palettes are amazing too. I'm trying to keep a more edgier and sophisticated color palette but at the same time kid friendly and approachable. So keeping tabs on great colors I see on Pinterest, and using sites like colourlovers.com. Q: Do you keep a sketchbook? I don't really keep a sketchbook anymore. Only because the way my life is structured these days I have very little free time to do so. 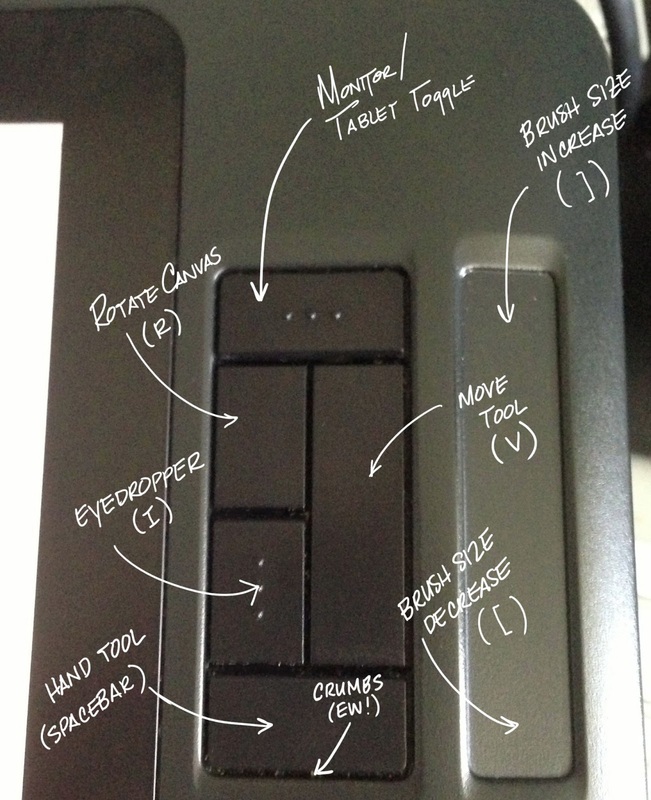 I do however, keep sketch files- little bits of file in Illustrator I play with. Sometimes when I'm working on a project and an idea sparks, I will start an illo on the side and eventually it gets cut and pasted to its own separate file. Q: How important is it to market yourself? It is definitely very important part of being an illustrator. I'm always wondering if I can be doing more. My agent certainly helps me market and show my work to potential clients through illustration directory websites, catalogs, conferences, etc. But one thing I always like to mention is that I've never stopped marketing myself once I had an agent. Why not help myself? Why not double the efforts and hopefully cast a bigger net? It is my own career after all and I should take charge. 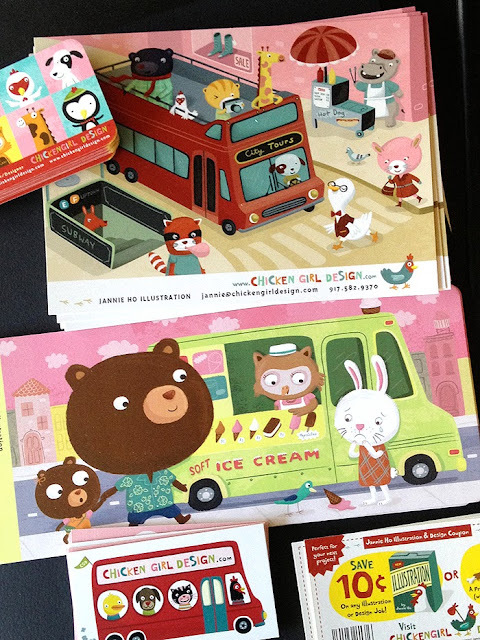 Some of Jannie's colorful, fun promotional materials! Q: How do you decide what work to show online? In my portfolio/website, I tend to show pieces that I enjoyed doing, hopefully attracting more of that type of work. And usually it ends up being a lot of personal or self promotional pieces. In my blog, I tend to like to keep an update of all my professional projects and what I've been busy with. I've been terrible with keeping up with my blog however. Facebook and Twitter really replaced my blog. Q: What are your favorite tools? I'm perfectly happy with a Wacom tablet and Adobe Illustrator! I always love hearing about new ways/tools to work, especially digitally. Keeping up with what is out there. But ultimately I do keep things very simple. Q: Are there any exercises or experiments you do to keep your creative juices flowing? One great trick I've learned recently is a style analysis. Take a piece of art that you love, and write down all the elements that make up that piece of work. The way the lines are, the colors, etc. By doing this you can find out what you really love about the piece, and apply it to your work in your own way. Sometimes we see a piece that is amazing but can't really point out why we are attracted to it. This is a great way to get creative juices flowing. To get out of a rut, it seems to be a fine balance of knowing when to stick with it and when to walk away. Sometimes you just have to sit with the art till that eureka moment comes. Or sometimes I feel like I'm unbalanced in other areas in my life and I need to tend to that first before coming back to something creative. One thing I know is that everyone experiences it and its part of an artist's journey. Q: Would you mind giving us a peek at your workspace? 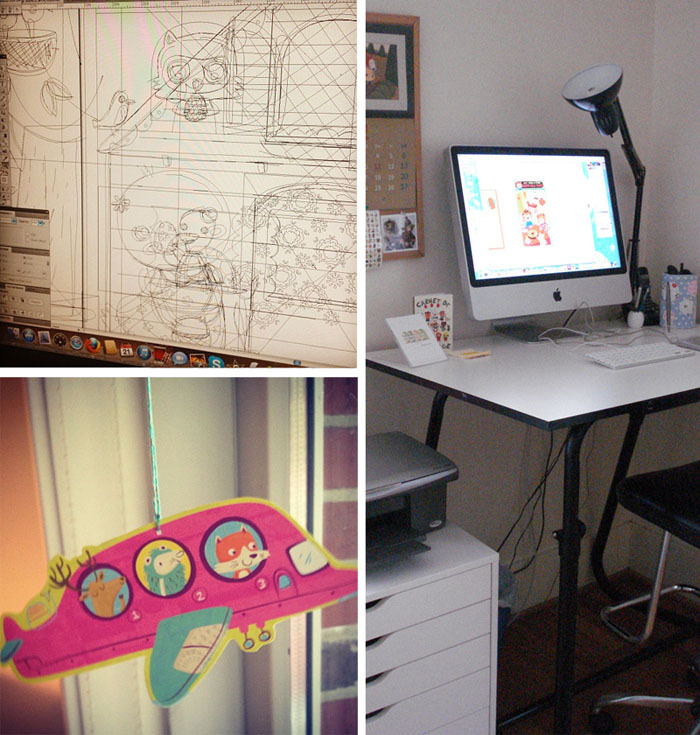 My workspace could use some more inspiration! I'm in a somewhat temporary situation so my space is currently not what I envision for myself in the long run. But I do have a lot of little toys and trinkets around that make me smile. Q: What's the most fun thing about being an illustrator? I still can't believe I get to draw for a living! Getting to create my own worlds, having books out there to share my vision with others. That is pretty rewarding. Q: Do you have any upcoming projects or news you're excited about and would like to share? 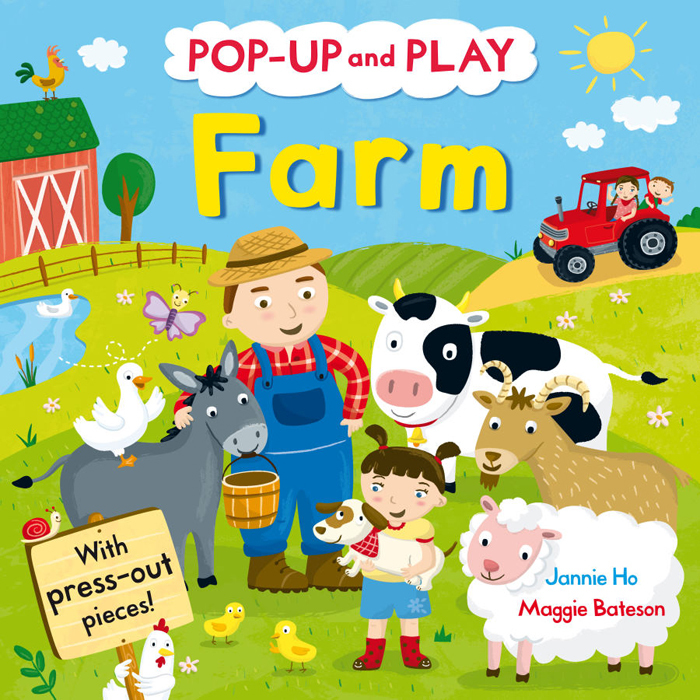 I have a wonderful Pop-up gift book coming out in the Fall published by Campbell Books in the UK. It is called Pop-up and Play Farm and I worked with the amazing paper engineer, Maggie Bateson. 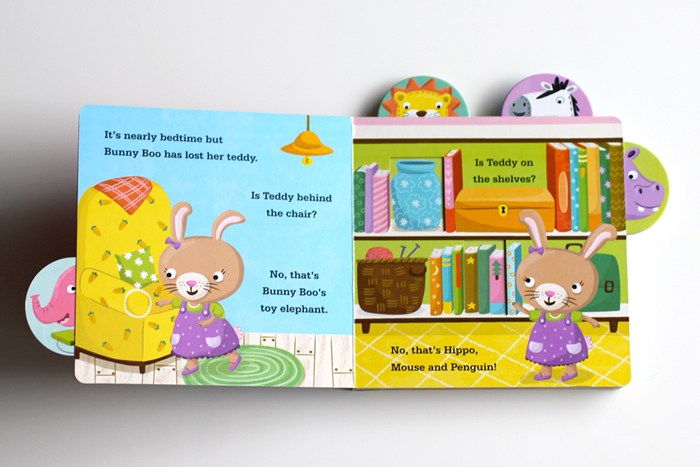 I'm also happy to share that the board book series I illustrated called Tiny Tabs are coming in the US! 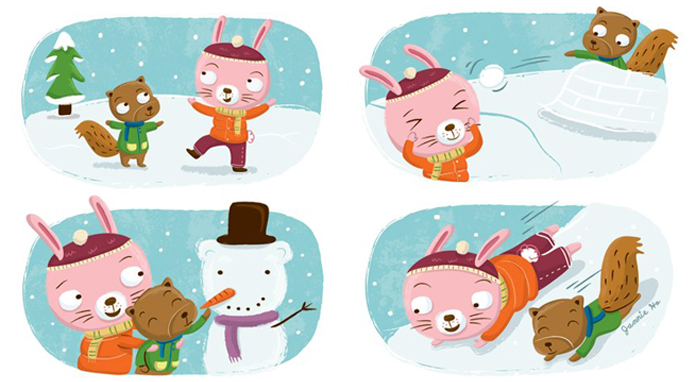 They are currently published by Nosy Crow in the UK and will be in the US February 2014 through Candlewick. Follow her on Twitter and check out her Facebook Page! Thank you so much, Jannie! Your work is so bright and lovely and, I can say this having met you in person...it's just like you! D'aw. 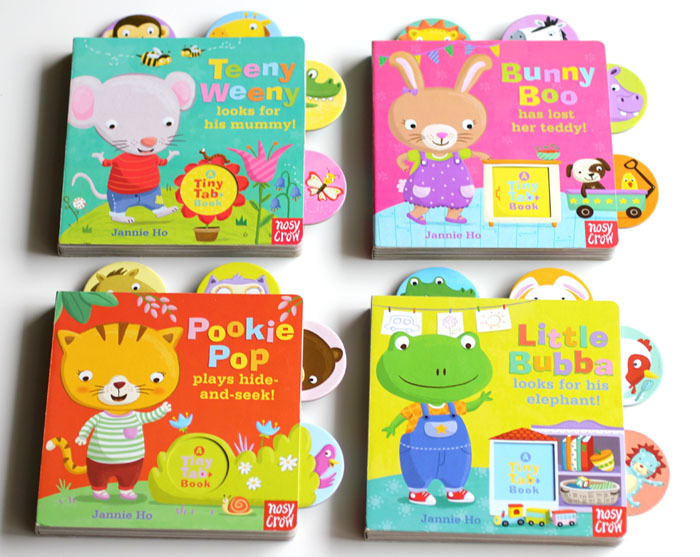 Congratulations on all of your new books, they're beautiful and fun and all the kiddos are going to love them! But love what you do. Some words of wisdom that have been consistent throughout our interviews: Never give up. And that concludes the self help portion of this blog post. Thanks for following along with our SMA Interview Series, everyone!